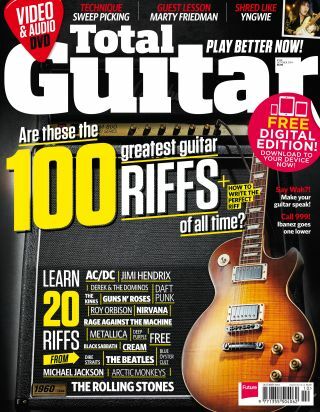 Total Guitar issue 258 on sale now: the 100 greatest riffs of all time? Plus! Special edition DVD with 20 video riff lessons! Total Guitar issue 258 is on sale in print in the UK and digitally worldwide for iOS and Android from today. Inside, we look at BBC Radio 2's recent 100 Greatest Riffs poll, chosen by a music industry panel, and voted for by Radio 2 listeners. We dissect the list, and find out which ones we agree with, the ones we don't, and the ones we feel are missing. We've packed a special edition DVD with video lessons showing you how to play 20 riffs from the list, and we've also analysed the BBC's top 20 to find out exactly what makes the perfect riff. Plus! Gear from Ibanez, T-REX, Vintage, VOX, Washburn and loads more!